Within our community there are individual strengths to be celebrated, weaknesses to be overcome, and life-long friendships to be fostered. The official school colors, blue and gold, stand for academic and personal success. Our logo depicts children with joined hands under the cross which also expresses our spirit of community. 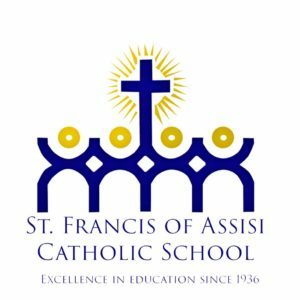 Our sports program embodies the spirit of cooperation and collaboration that makes Saint Francis students successful. Whether playing on a Bend Park and Recreation Team soccer as a first grader or running on the Middle School Track team our students represent our community in the spirit of our patron saint. St. Francis, was gentle enough to tame wild animals, strong enough to endure the wounds of Christ, and fierce enough to change the culture in which he lived. We believe that any family who comes to us seeking a Catholic education for their children should be included. We offer financial aid and a parish member discount to assist our families. The amount of tuition assistance we can offer is determined by our annual fundraisers, the level of parent volunteerism, and family income. Please see the Registration Page for more information.